Dennis and I were so fortunate: my grandmother owned the big ranch house on the north side of the property as well as the land on which we eventually built—which I’d explored and mused to my grandmother about how wonderful it would be to build a house down there. She and my grandfather had been advised against because of the flood plain, but she and I were convinced it was possible. At my wedding shower, all the women were instructed to write advice-to-the-bride, and she wrote in her bold, looping hand, “Always do as Gran does” (I still have the slip of paper). Wedding eve (or maybe a few days before), I spied my grandmother, in her elfin red hooded sweatshirt spriting from tree to tree tying white ribbons around the oaks that bordered the forested river bottom part of her land, which she had originally wanted to build on. I waited some suitable minutes, then sallied up to her house. She explained that she had determined the value and set aside the same amount for my younger sisters for down payments on their houses when they were ready. I should build a house next door. I remember that happening just before the wedding, but it had to have been earlier because there’s a photo of our college friends who’d come from out of town for the wedding, March 1985. It’s the post-nuptial morning after we’d all danced into the wee hours, and, in the photo, we’re up after coffee, nine of us posed on the site of the house which Dennis and I had spent months clearing. The homesite was thick with a forest of blackberries, figs and water willows, so we didn’t even know what the terrain looked like. In this remote area, many people fly small planes; Dennis was a pilot, so I took aerial photos from the co-pilot’s seat as we passed back and forth over the site. One area had to be higher—the leaf color was different, lighter and less soggy-looking. A creek ran slowly on the north and more quickly on the south edges of the nearly seven acres. We hacked our way in and found solid ground in the center of almost seven acres. First with machetes, then with a chain saw, and a mower attachment on a tractor, we began clearing, accumulating sweat and deep scratches. Eventually, confident that there’d be enough high ground, we stepped up and bought a Case backhoe. We talked about the house as we worked. In tight places I tend to feel closed in. I grew up in two beautiful homes in Southern California, one with a kitchen table and lanai/playroom that opened out to a shady patio and a massive olive tree, the other with a family room that spilled onto the patio deck and azaleas and a pool. In the second house, a stately white colonial, airy and beautifully decorated, it was logical that as eldest of three daughters I would sleep in the “maid’s quarters” downstairs with my own bathroom, and the little girls would inhabit the upstairs bedrooms in the front of the house. I appreciated my privacy, but the room was closed off from the view of the yard. The window looked on the driveway; the pool and beautiful yard was blocked by a wall. My junior year in high school we had an exchange student from Switzerland, so my two sisters shared one upstairs bedroom and I came upstairs to share the front bedroom with Franzi. The windows of that room looked out on a liquid amber and the front lawn and a grand oak beyond in one direction and the neighbors’ trees and side garden on the other. The beds and desks were oriented to the view. When Franzi left, we reverted to the previous arrangement. By then, a senior in high school, I talked my fifth-grade sister into switching rooms with me, listing all the benefits: private bathroom, close to the kitchen, etc. We moved all our possessions one Saturday when I was babysitting. When my parents returned, of course, I had to trade places back. The next several years were in dorm rooms. The other space I’d loved was my church, St. Edmund’s Episcopal in Pasadena with high ceilings and windows, a choir loft and alcove, and a pleasing confluence of formal and informal attitude. I’d read a magazine article about a church converted to a house, and I daydreamed about such a space. Dennis had grown up in a tiny farmhouse in which every room was multi-purposed. For instance, he slept in the laundry room/pantry. The kitchen table served as the sole dining space. They spent a lot time outside. His brothers became engineers, while Den, the youngest by 15 years, studied ecology, then took the vocational course in horseshoeing, worked hard, invested, and out-earned his older brothers. (He went back to study survey engineering at Fresno State at one point, but before he finished, he was presented with an irresistible opportunity in the cattle business). So, I wanted a high ceiling, view of trees, and an open floor plan; Den wanted it to be efficient, passive solar and self-sufficient. Having dreamt and drawn floor plans since junior high (I’d wanted to be an architect until Mr. Canner’s trig class), I’d thought about house plans before. In the evenings, I’d show my drawings to Dennis and our newly single photographer pal Scot Zimmerman, a regular dinner guest. We were pleased with the tidy efficient plan I’d sketched until we found out the flood zone required us to raise it three and a half feet, so the elevation would have teetered tall and ridiculous in the setting. I didn’t know the term “organic” architecture at the time, but that’s what I craved. Of our perplexing architectural problem, Scot said, “You of all people need to meet this guy I’ve been doing pictures for.” So Scot introduced us to Arthur Dyson in the brick office by the railroad tracks on P Street. We were impressed first by the sign, a wood, mirror and metal collage set on the bias. I brought my graph paper drawings and told him why we’d done what we’d done, but that the elevation just didn’t work. It’s funny, I picture this conversation happening in the Lencioni Home at the dining table, but that’s impossible because it’s a planning meeting for that house. Art corroborates that it was in his office; we were sitting on one side of a table and he sat across from us. “We need to lengthen out the lines,” he said, smoothing his hand in an arc, as if over an expectant mother’s belly. “And then come back in,” he continued, both hands now, gathering from apart at his shoulders scooping in to meet, hands cupped at his heart. The house looks like that—arched as if it has erupted gently out of the river bottom, as if next season it will burst into flower like an amaryllis. Over two sessions, he asked questions that had less to do with form and more to do with preferences in music, art and food, where we liked to vacation, our childhood memories, the patterns and rhythms of our life. Our backgrounds—Dennis’ and mine–were not similar. I’d grown up in an upper class suburb of Los Angeles, and my father is a successful LA lawyer, my mother keeps a lovely home and is active in the community; my family all have advanced degrees from Stanford, USC, and UCLA. Dennis’ family struggled to farm cotton and grapes; his father died while we were dating. Dennis and I responded reflexively because we didn’t know to be cagey or clever. Art asked, “When you doodle, what do you draw?” The imagery is so prosaic now, but we were too naïve to know that: I showed him curves and concentric circles, and I still make this ripple pattern around words or objects like a slow river lapping a protruding tree or the pattern after a fish has surfaced. I drew flowers, fruits and vegetables and trees. Dennis’ doodles were more angular (now, I’d say, more masculine), but when he drew designs for metal work, they were floral. He loved the shape of a Porsche Carrera. All of those are reflected in the house design. 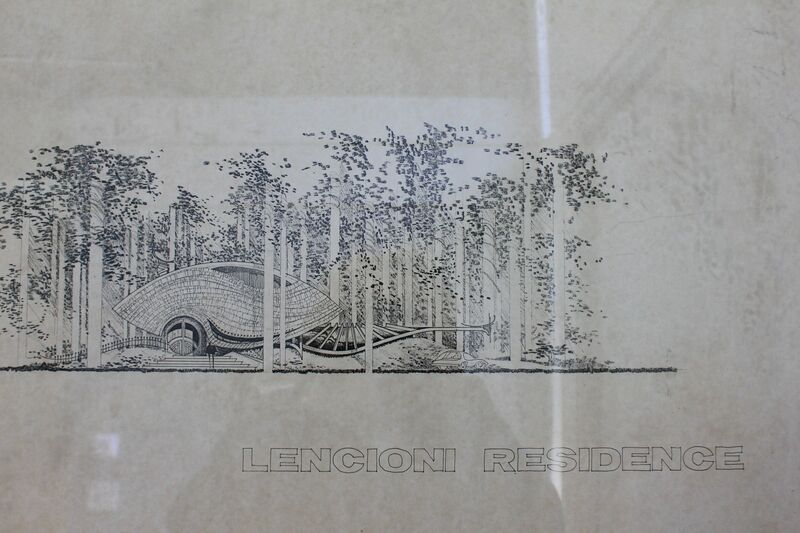 On his hand-rendering of the elevation, because we were newlyweds, Art drew a mock picket fence encircling the house and a very cool sports car for Dennis with the same “female” lines they both admired in cars.